The first time I met Baley she was so small, she fit in my son’s hand. 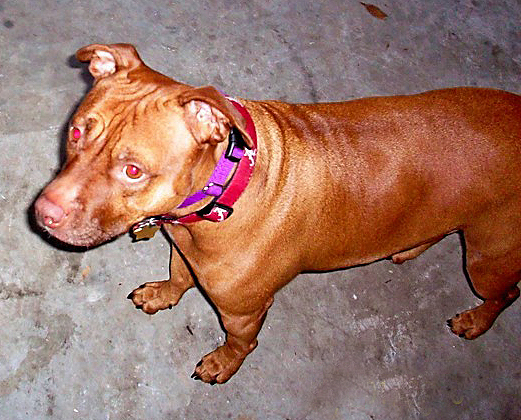 As you can see, she has grown to be a beautiful red-nose pit bull that is loved by so many. She truly is a nanny dog. She’s entertained my friend’s 18-month-old baby who brings her toys, and she sneaks in kisses. The baby laughs so hard when this happens that he gets all of us laughing. 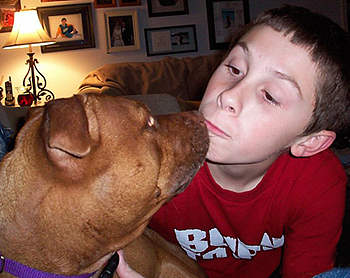 Baley and my son John came to live with us a few years ago. She stayed by my son’s side when he was in his room, in a chair or in bed. When my son would fall asleep, she would snuggle up with him to get warm. It became such a habit that he would lift the covers in his sleep when he felt her nose touch him. The morning of April 29, 2009, she laid waiting in his bed for him to come out of the bathroom. Sadly, he never did; he died during the night from a drug overdose. Baley and I grieved together for the love of our lives. It was so hard on her. I tried to comfort her the best I could while dealing with my own grief. We had to get rid of his truck because when she saw it each day, she went running to greet him the way she used to when he was alive. She seemed so disappointed to see that he wasn’t there. After some time, Baley started feeling a little better and so did I. She knew I was going to take care of her. She is now my princess, and I love on her every chance I get. Prior to my son’s death, we got ourselves a little guy named Buddy. He is a little black and white bundle of joy and Baley’s best friend. She lets him bite her lips, her legs, and she flips over so he feels like he’s tough. He can do anything to her because he is her best friend and the leader of the pack. She goes by whatever he wants to do. As far as our shared grief, Baley and I are better each day – but some days we have our heavy thoughts of John. On those days, we just let ourselves feel the grief. 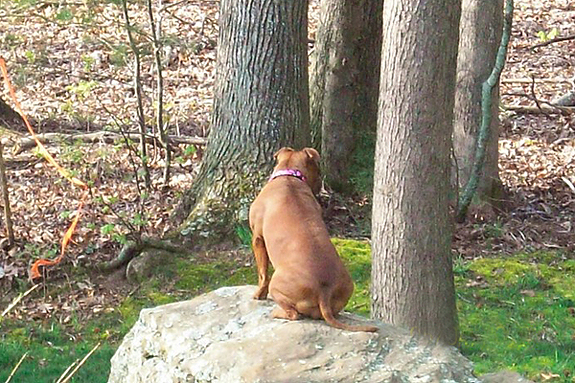 We have this rock in our backyard and Baley loves to stand on it. She acts like she’s queen of the yard. It’s a joy to see her standing there. I have heard all the stories, heard all the bad things pit bulls do, but I have never had such a sweet dog. I will defend them until the day I die. I believe it’s all how they are treated. 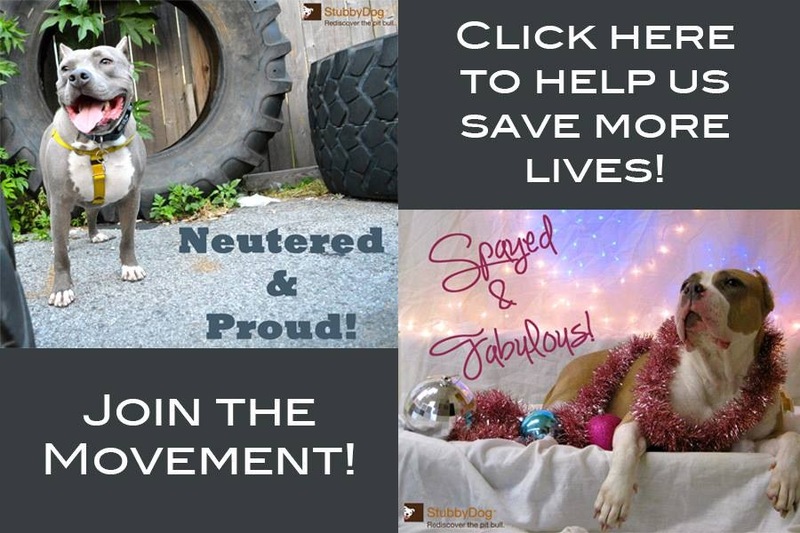 I say you want a wonderful pet – loving, dependable, adores you and is your best friend –get a pit bull and treat them right. What a beautiful & poignant story. so sorry for your loss. But there is nothing like the unconditional love of a dog to mend the heart. Thank you for this beautiful, touching story. Well said!! I’m so sorry for the loss of your son. I am however glad that you and Baley have each other and the little b+w Buddy. God Bless you all. This is heartbreaking and I’m so sorry for your loss… Thank you for embracing Baley and keeping her safe and loved through this very difficult time for both of you. My best to you both and Buddy too! First of so sorry for the loss of your son. Second all thank you for loving his girl as your own. In the world of disposable pets I fear what would happen to my babies should the time come and I am no longer around. Kathy, I just wanted to say, I’m praying for you. Re reading this post, I cannot begin to imagine what you’ve been through. I pray that you’ve found peace and comfort. I hope that you, Baley, and Buddy are well.